Filling sandbags can an easy process with a bit of planning, preparation and precautions. There are Five main items to consider when preparing for a successful sandbag filling operation. The Bagger holds open and closes bags. One member of the team should place the empty bag between or slightly in front of widespread feet with arms extended. The throat of the bag is folded to form a collar, and held with the hands in a position that will enable the other team member to empty a rounded shovel full of material into the open end. The person holding the sandbag should be standing (or sitting) with knees slightly flexed, and head and face as far away from the shovel as possible. Shoveler - shovels sand into sandbags. The shoveler should carefully release the rounded shovel full of soil into the throat of the bag. Haste in this operation can result in undue spillage and added work. The use of safety goggles and gloves is desirable, and sometimes necessary. Mover - carries and places sandbags. The mover transports filled bags to a staging area, truck for delivery or pallet for large volume operations. Use gloves to protect hands contaminants in sand and floodwater. Avoid touching your eyes and mouth. Wash your hands and face before eating or drinking. Use safety glasses, particularly on dry and windy days and when working with automated equipment. Wear work boots (waterproofed if working in floodwater). Use waterproof gear if working in floodwater or rain. Use protective clothing if exposed to polluted floodwater. Wear reflective clothing when working at night. Use a personal flotation device when working near floodwater. Use a Round Point No. 2 Shovel for filling the sand bags. This style of shovel is better than a Square Mouth style because the rounded tip can fit inside the opening of the sand bag. Any usable material at or near the site has definite advantages, but a heavy or sandy soil works best for filling sandbags. Fine sand could leak out through the weave in the bag. To lessen leakage, double bag the material. Gravelly or rocky soils are generally poor choices because of their permeability. Filled bags of earth material will deteriorate quickly. Do not overfill sandbags - fill bag 1/2 to 2/3 full. Bags should be filled between one-third (1/3) to one-half (1/2) of their capacity. This keeps the bag from getting too heavy, and permits the bags to be stacked with a good seal to the ground surface and lower layers of sandbags. The best sandbag is 14 x 26". This is ideal because it can be filled to 1/2 full and the filled weight will be under 30lbs. 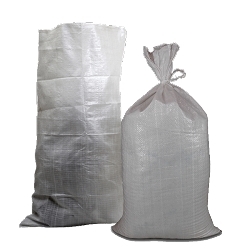 Larger bags (like feed bags) will be heavier when properly filled and more difficult to carry and move.